CLARK COUNTY — Four of the eight area school districts on strike reached a settlement over the holiday weekend. Students at Ridgefield and Hockinson are back in class today after nearly a week of delay. Camas schools are starting on time after teachers voted late last month to strike if a new deal wasn’t reached. 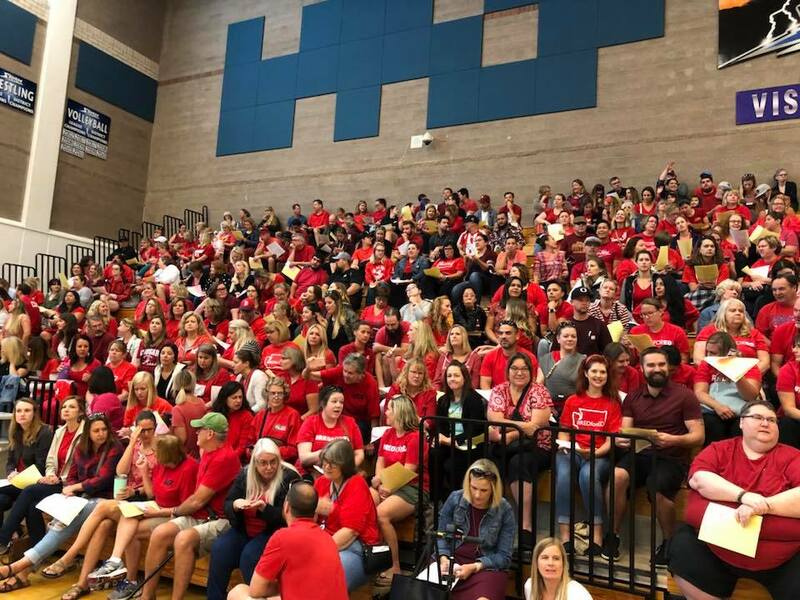 This morning, 1,517 Vancouver teachers came to Skyview High School to vote on a deal there, with 92.4 percent approving. The contract would reportedly increase teacher pay by approximately 12.5 percent this year, with a two percent bump the following two years. That would put starting pay at $50,413 this year, with the top end at $95,019. In 2020-2021, top-end pay would be around $99,000. Vancouver teachers will be back in class on Wednesday. In Hockinson, teachers unanimously approved their new deal at a meeting on Monday. The school board has scheduled a special meeting on Wednesday to vote on the deal, but school began Tuesday. The deal will give Hockinson teachers a 14.5 percent raise this school year, and another 2 percent bump in 2019-2020 and 2020-2021. This year, the new salary range will be from $49,578 to $93,445. The deal also includes reduced class sizes for K-5, and decreased workload for special education teachers. Ridgefield teachers also voted Monday to approve a new contract there, though not unanimously. It will increase teacher compensation by 16.2 percent this year, with an additional 5 percent raise in years two and three of the contract. The district says that equates to a 26.06 percent pay increase over last school year by the end of the new contract. The salary range for teachers next year will be from $48,346 to $95,788. In year three, it will be $50,774 to $100,598. The district also agreed to gradually reduce K-3 class sizes, and put a cap on middle and high school classes. The Ridgefield Education Association says teachers will also be given a stronger voice in the selection of curriculum. In Camas, teachers approved two-year deal that will increase a raise that will see starting salaries next year begin at $50,727, and top out at $97,529 for someone with 16 years of experience, a Master’s Degree, and 90 college credits. In 2019-2020, that will range will be $52,868-$100,110. The second year will also reduce the number of years required to reach the top end down to 15. Clark County’s largest district, Evergreen, remains on strike, and teachers are indicating that a deal may not be imminent. School has been canceled for at least a sixth day, through Wednesday. The district says both sides are reviewing proposals from meetings over the weekend. A state mediator is scheduled to meet with both sides again on Wednesday morning. On Monday, the district released a statement with details of their latest offer which, they say, would keep Evergreen teachers the highest paid in southwest Washington. The two-year deal would start teachers out at $51,288 this year, and $52,263 next year, with a top end going from $98,279 to $100,090. The district says $11,561 per full-time teacher would still be coming out of local levy money, which is being reduced by $29.5 million dollars per year starting in January. According to the district’s calculations, that would mean potential cuts to other levy-funded resources starting in 2019-2020. The Evergreen Education Association has blamed Superintendent John Steach of stonewalling negotiations, sometimes failing to show up and not empowering people sent in his place with the ability to make concessions. In Battle Ground, the district sent out a revised offer on Monday it says would equate to a 19.3 percent raise over the next three years. It would increase the average teacher income in Battle Ground from $66,685 last year, to $73,343 this year, and $79,534 in year three. The Battle Ground Education Association is, according to the district, asking for a one-year deal with a raise of just over 24 percent. “Like the other districts that have settled around us, we believe we can give our teachers a fair and sustainable increase that utilizes all of the McCleary money in multiple years,” Battle Ground Superintendent Mark Ross said in the statement. Things have gotten a little testy in Washougal as contract negotiations continue. On Monday, the district released what they said was the latest proposal from the Washougal Association of Educators. It would increase base starting pay to $53,054 next year, with the top end at $99,999. The district says their latest proposal is for a starting wage of $51,522 and a top end of $95,783. Bargaining was expected to continue this morning, and the district has not yet announced whether school for Wednesday will be canceled.